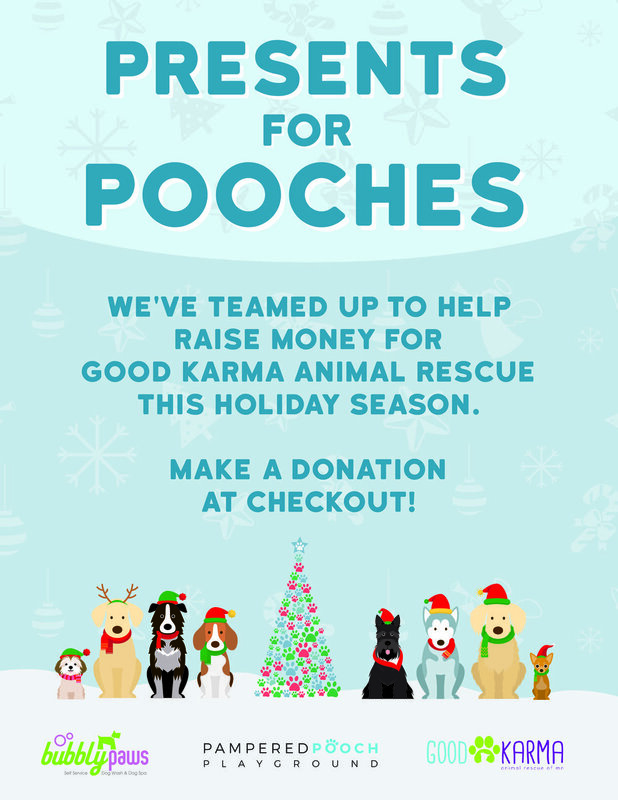 This Holiday season Bubbly Paws and our sister business, Pampered Pooch Playground have teamed up to raise money for Good Karma Animal Rescue. You can make a donation in store, or online by clicking here. Meet Julie! She is the General Manager at Bubbly Paws. You maybe have seen her hanging out at all the locations. We thought it would fun for everyone to get to know her a little better! What is your favorite thing about working at Bubbly Paws? The obvious answer is seeing the dogs on a daily basis, how can you not smile when you are around dogs! But I also have the opportunity to work at every store and manage an amazing staff, we truly have an amazing team. What is your favorite thing about living in Minnesota? I have lived in Minnesota all my life and one my favorite things is watching the seasons change. We definitely have brutal winters but we have so much to do here no matter what time of year! What do you like to do outside of work? Outside of work I love spending time with my husband and two dogs, Duchess and Thor. We love craft beer and often explore new breweries on the weekend! I also love to cook and try new recipes out! We're proud to be a Small Business, and are excited to announce our Small Business Saturday savings. Purchase a $50 gift card and receive a FREE $5 gift card (available online in in store) and 15% off all retail items! And as an extra bonus, all these offers will be available on Black Friday as well. We have teamed up with our sister business, Pampered Pooch Playground and our friends at Westgate Pet Clinic to raise money, food and treats for Good Karma Animal Rescue. All food and treats need to be un-opened. Starting Friday, November 24th until January 1st you can make donations at any of our locations or online by clicking here. If you donate $50 online, by clicking here you will receive a $5 gift card to Bubbly Paws. It seems like just yesterday that Lill, our General Manager just started working at our Saint Louis Park store. I remember her first day very clearly, it was almost 6 years ago, the day before Thanksgiving. I remember it so well because she fit right in, and immediately understood how to interact with customers, and really loved the job. Lill has been with us since the beginning and was a huge reason that we were able to expand and she worked her way up to our General Manager position. She was there for each store that we opened, but more importantly, she LOVES Bubbly Paws and coming to work. In a nut shell, Lill is a small business owners dream team member as her passion, and love of the company came through in everything she did! After 6 years, Lill has decided to move on, and we are very excited for her and sad at the same time! She has been such a HUGE part of our work and personal family and know she will go on to great things! Thanks Lill, for an AMAZING 6 years!! A Big thanks to WCCO TV for stopping out to Paws on Grand at our St Paul store. We love to sponsor such a great event! You can watch the full video below. 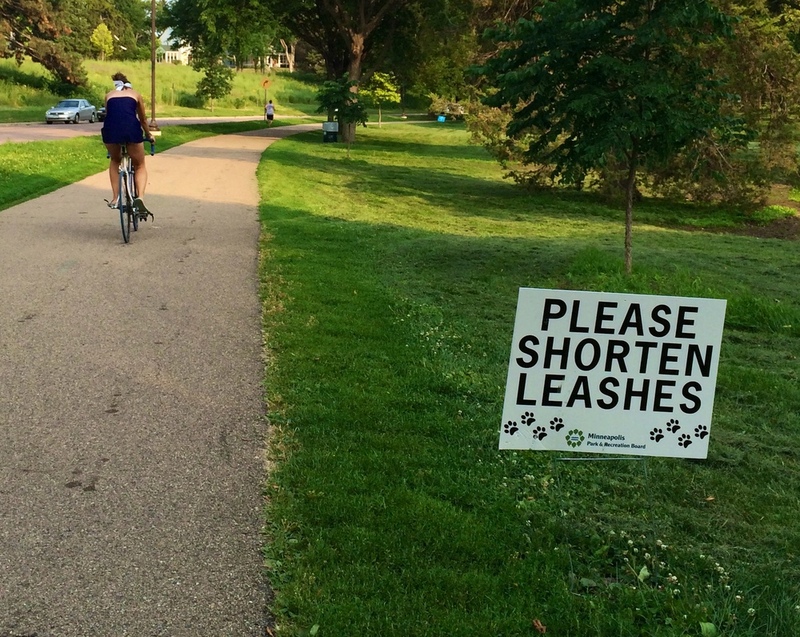 ST. PAUL, Minn. (WCCO) — Hundreds of dogs filled St. Paul’s Grand Avenue on Sunday for the annual Paws of Grand event. Grand Avenue businesses partner with local animal rescue organizations. The event features lots of pet-friendly activities, like a pet photo booth and fashion show. “Well it’s great, brings a lot of awareness to dog rescue groups and dog related non-profits. It also gets dogs adopted, but also provides a fun, free activity for families to do,” Lill Luce with Bubbly Paws said. Bubbly Paws and several other businesses along Grand offered special deals and discounts on Sunday. How involved are the Bubbly Paws Owners? Our friends from Intuit Quickbooks stopped out and asked how involved the owners of Bubbly Paws are. Watch the response below. Our friends from FOX 9 stopped out to Bubbly Paws in St Paul to talk about Boo Fest and see some dogs in Halloween costumes. 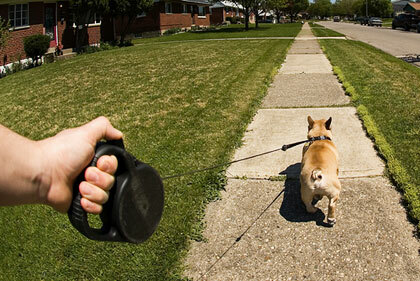 Looking for a cool new trick for your pooch? How about having them get the mail? Check out this awesome trick! Best Pet Groomer... But We Don't Pay For It! I am so excited to announce that Intuit QuickBooks has selected Bubbly Paws dog wash and dog grooming as a small business to feature on their "Own It Everyday" small business video series. These videos will appear on their Facebook and other social media channels. Yesterday a film crew from LA come to our Saint Paul location to shoot our segments. We had so much fun filming with them and we even came up with a new "jingle" that you will start hearing on Bubbly Paws Radio (you know the station we play when you are bathing your pooch). We don't know when the videos will be released yet, but watch our Facebook page to be the first to know. The film crew was in Minneapolis for the past few days and also recorded segments at two other Minneapolis businesses, The Beez Kneez and Sociable Cider Works! When we first opened our first Bubbly Paws location, we always wanted to be much more than just a business. We wanted to give back to the pet community community in which we are located. Over the years we have done this in various ways from donations, silent auction items, fundraisers, sponsorships and more! I am happy to announce that in 2014 we donated over $10,000 in goods, services and money to local pet rescues and shelters in the Twin Cities! We want to do even more good and help even more people in the community! This year we are kicking off our "Random Acts of Bubbly" campaign. Throughout the year we will be helping out local rescues and shelters! If you have any ideas on how we can help, feel free to contact me! Because we are a small business, we can't handle every request we get, but we will try! As a small business owner, one of the greatest joys is giving back and helping those in need! Make sure to keep an eye on our facebook page and our blog to see what we have been up to! In addition to the Bubbly Paws crew giving back, we strongly encourage all of our customers to create their own "Random Acts of Bubbly". Let us know what you have done to help out in the Twin Cities, use #bubblypaws or share it on our Facebook page! Our first "Random acts of Bubbly" is going to take place this week! I will give you all the details soon! Have a safe and happy holiday season! Thanks for all of your love and support in 2014! Appointments are first come, first served. We get pretty busy, please plan to wait a few minutes. Paw points are NOT given out for discounted services. Starbucks - It was ok, a little too spicy and not enough pumpkin flavor. Caribou - Good pumpkin flavor but a little too sweet. Chez Arnoud - It was just right... The perfect mix of pumpkin and spice... Just like a pumpkin pie! As the Pumpkin Spice Latte season continues, we will update this list as Mallory gets her coffee fixxxxxxxxxx!! Todd Walker from FOX 9 stopped out to our Saint Paul dog wash to promote Paws on Grand. Paws on Grand / Bubbly Paws/ FOX 9 - 9am from keithppp on Vimeo. Coco has been a regular at Bubbly Paws since she was a tiny puppy. When she was ready for her first big grooming she was calm and comfortable allowing Mallory to give her a great cut! Every dog needs to be groomed, at least a little. We love seeing new puppies (who doesn't?) but it is even better to see young dogs get regular nail trims and baths so they start a lifetime of grooming on the right paw. I often get asked when you should first get your dog groomed and the simplest answer is soon after they have their vaccinations up to date enough to make other trips in public, usually around 10 weeks old. Many dogs do not require regular grooming so as long as bath time and nail trims are done in a positive way a few times during their puppyhood they grow up being calm and comfortable with normal healthy grooming chores. However, if you have a breed that requires grooming it takes a little more planning to make sure your puppy has the best chance at being positively accustomed to grooming. Breeds that require grooming are anything non-shed, hypoallergenic breeds from Bichons to the biggest doodles. These breeds need to be groomed on a regular schedule for their whole lives. Bubbly Paws offers a great deal with our Puppy Package, for puppies' first groom before they are 6 months old. We offer such a great deal because we believe grooming should be a low stress and fun activity for your dog and the best way to do that is to start early and make the first grooming a good one. In the Puppy Package we get all the good healthy necessities done, like a bath and nail trim and hope to get some more trimming done but we play it by ear. If the puppy is doing great maybe we'll get an all-over haircut done but if the puppy is stressed or too wiggly we focus on using positive reinforcement on calm behaviors and offer breaks for play time and to let out some energy before getting back to business. Puppy coat is so soft and lovely, it's hard to see it go when they start growing up. You may want to keep your Wheaten terrier's puppy coat until they are 9 months old but it might not be the best thing for your dog. Unless you are brushing your dog thoroughly everyday that puppy coat will matt when the adult coat starts coming in. Nothing is more stressful for your dog and our groomers then having to shave down a matted dog that has never been groomed before and that has all the energy a 9 month to year old dog might have. It's much better to plan regular grooming (even just a bath and brush out or a little trim) every month or two and part of everyday to brush your dog. By preventing tangled fur you can prevent your dog from having to be shaved and keep that soft puppy fluff as long as possible. 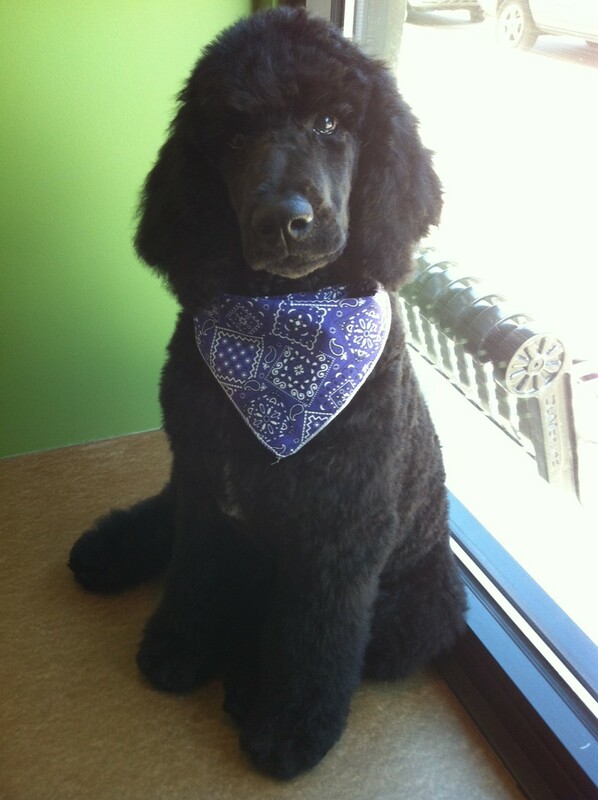 Shadow had his puppy's first groom at 4 months old and was so well-behaved Jessica was able to give him an all over trim! We work hard everyday to make grooming fun and we (and your puppy) hope you do too! Grooming is offered daily at both our locations.